For this wildly unique and original spirit, we took an array of herbs and spices, including one of the most popular spices in the world (mustard seed), and turned them into a delicious, savory liqueur. In addition to an array of mustard seeds, we added turmeric, garlic, fresh baby dill, damiana leaf and many other herbs and spices, along with a touch of wildflower honey. The resulting spirit is an intriguingly herbal, layered liqueur with bright spice, nuanced honey sweetness and subtle bitter notes. Ethel’s Eye of Newt Cordial is 80 proof. 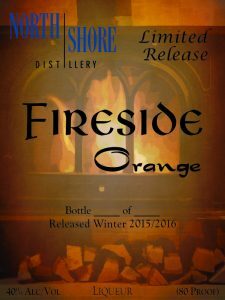 Fireside Orange (80 Proof) – Perfect for sipping by the fire, or as a nightcap on a cold winter’s night, Fireside Orange featured an intriguing blend of three orange varietals, linden flowers and a range of spices. Much more than an ordinary orange liqueur, Fireside revealed new layers of flavor with each sip. SommerWeizen (80 Proof) – Inspired by friends in the brewing world, our distilling team created an abstract interpretation of that classic summer staple, the Hefeweizen beer. Rather than simply distilling a beer, we distilled hops and other botanicals and blended them into a wheat whiskey we made specifically for this endeavor. Silver Lining (84 Proof ) – This American Kräuter Liqueur was inspired by our bartender friends, and was our take on a traditional German kräuter (herbal) liqueur. While most kräuters are targeted at college-age consumers, ours is a more sophisticated, delicious version, intended for our adventurous friends and drinking compatriots. We infused and distilled the spirit with a wide range of herbs and botanicals, most notably cacao and locally roasted coffee. Eldergin (52 Proof) – Inspired by sloe gin liqueur, Eldergin was a perfect blend of our Distiller’s Gin No. 11 and fresh elderberries. We used over 250 pounds of fresh elderberries, some of which we picked ourselves. After our still, Ethel, softly cooked the berries, we pressed them with a wine press to extract the juice, and melded it over time with a specially distilled batch of Distiller’s Gin No. 11 and a touch of cane sugar. CR2 (50 Proof) – We decided to show that you can make a cocktail in the bottle and make it well. For this project, we chose a fantastic old cocktail for inspiration – one that requires ingredients that aren’t always on hand, and that when made properly, is a joy to drink – the Corpse Reviver No. 2. Mole Poblano (90 Proof) – Mexican cuisine has always been a favorite of ours, and we took inspiration from a traditional Mole Poblano sauce in crafting this spirit. Made with seven types of chili peppers, we also ground our own cacao beans and added a range of herbs and spices to the mix. Alphonso Mango No. 11 (75 Proof) – We had heard stories about a particular variety of mango from India called the Alphonso mango. Claimed as the king of mangoes for their incredible taste, and superior to all other mangoes, we were quite curious. After experimenting with different combinations of spirits and botanicals, we found that this fruit matched perfectly with our Distiller’s Gin No. 11. We hand peeled, pitted and sliced the mangoes over several weeks, and infused them into our gin for a batch of deliciousness. Rhuginger No. 6 (84 Proof) – We made our way to a local farm for 150 pounds of fresh rhubarb, picked the morning we got it. We infused the rhubarb with our award-winning Distiller’s Gin No. 6, and added fresh ginger root for another dimension of flavor. The result was an incredible new gin, the likes of which have never been seen on the market before. Ceylon Tea Infusion (90 Proof) – With our passion for gin and for tea, we searched around for a number of months looking for a tea to pair with No. 6. Then we came across a wonderful Ceylon black tea from, of course, Sri Lanka. Full bodied and bold, but not bitter, the tea married exceptionally well with Distiller’s Gin No. 6. This incredible spirit was delightful in a variety of cocktails, adding a rich tea note to almost any classic gin cocktail. Medjool Date Infusion (84 proof) – We ventured into uncharted waters, using a fruit that was neither en vogue nor over-commercialized (which is what attracted us to it). This surprisingly delightful infusion graced the palate with a complexity of date and spice flavors married together to form a symphony of tastes that finished with a delightful sweet note.